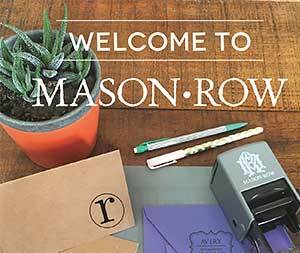 USER CONTENT includes user data made available, transmitted, uploaded, posted, or e-mailed including text, graphics, images, messages or other materials on, or to, www.MasonRow.com or any other website, microsite, or any other internet property owned, operated or sponsored by Mason Row. That you own or have the necessary licenses, rights, consents and permissions to all patent, trademark, trade secret, copyright or other proprietary rights ("Rights") to Your Content and any other works that You incorporate into your User Content. That You have the written consent, release, and/or permission of each and every identifiable individual person in your User Content to use such person's name, address, personal information or likeness in your User Content for use in the manner contemplated in these TOS. Not to include in your User Content any content that is unlawful, harmful, threatening, abusive, harassing, tortious, defamatory, vulgar, pornographic, offensive, indecent, libelous, invasive of another's privacy, hateful, or racially, ethnically or otherwise objectionable. You agree to indemnify and hold harmless Mason Row, and its subsidiaries, affiliates, officers, agents, or other partners, and employees, from any claim or demand, including reasonable attorneys' fees, made by any third party due to or arising out of Your use of and access to the Service, Your violation of the TOS, Your violation of any rights of another person or entity, or Your violation of any applicable laws or regulations. If any provision of these Terms or any document incorporated by reference is found by a court of competent jurisdiction to be invalid, the parties nevertheless agree that the court should endeavor to give effect to the parties' intentions as reflected in the provision, and the other provisions of such documents remain in full force and effect. The TOS, which apply to your use of the Service, provide that both you and Mason Row agree to submit to the personal and exclusive jurisdiction of the courts located within the City of Cleveland, County of Cuyahoga, State of Ohio, United States of America.